This article appeared in the Western Leader today and also at Stuff. We have no idea if this article is in any way related to our activity, but it is certainly relevant to our petition. We’ve submitted this letter to the editor of the Western Leader in response. The West Auckland Licensing Trusts Action Group is now collecting signatures for a petition to challenge The Trusts current monopoly. 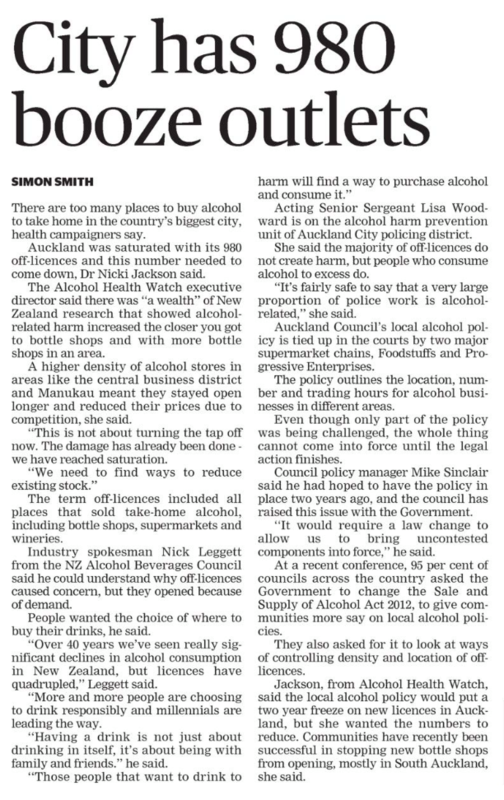 Should we be successful it is almost certain that West Auckland will have more off-licenses than today. We do not want more alcohol-related harm. We do want a modern, evidence-based system of control, where the central purpose is to minimise harms caused by alcohol. Under the 2012 legislation, District Licensing Committees (expert panels) assess license applications. They consider the relevant evidence and judge if the license will cause additional harm. Councils can also develop local alcohol policies to guide the DLC. Auckland’s provisional policy was informed by extensive community consultation and underpinned by academic research. These policies must be reviewed at least every 6 years, ensuring the policy reflects the latest research and stays up to date with the views of the community. In contrast, licensing trust monopolies were devised in the 1940’s and have evolved little since then. They remain a very blunt tool in the fight to curb alcohol-related harm. In West Auckland, The Trusts have been effective in reducing the number of licensed premises but they have not been effective in reducing harm. Their monopoly has stifled our local hospitality and retail industries, costing our communities in terms of jobs as well as enjoyable places to connect with our friends and neighbours. We agree that the high number of alcohol outlets in some locations around Auckland poses serious questions, but we don’t believe that licensing trust monopolies are the answer.